If you were hoping for a born-again Protestant to finally serve on the Supreme Court, keep up your wishful thinking (or sincere prayers). It’s probably not going to happen any time soon. At 23.9% of the American population, Roman Catholics make up 66.6% of the Supreme Court (we are counting Neil Gorsuch in that number, although he now attends a fairly religionless Episcopal church). At 1.4% of the American population, Jews make up 33% of the Supreme Court. President Donald Trump’s latest nominee for the highest court will not change those figures. 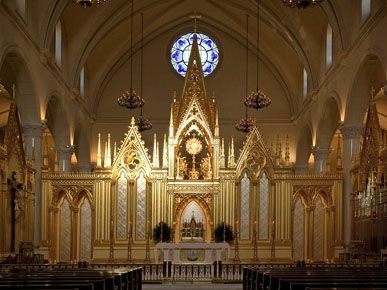 Kavanaugh’s Roman Catholic church home, Washington D.C.
Brett Kavanaugh is a Roman Catholic and is a regular lector at the Shrine of the Most Blessed Sacrament in Washington, D.C (not to be confused with Shrine of the Most Blessed Sacrament of Our Lady of the Angels Monastery, which is in Birmingham, Alabama). That church claims to serve 9,497 men, women and children (as of 2012; more recent figures have not been made available). The Georgetown Preparatory Academy is the oldest Jesuit school in the United States, having begun in 1789. A building on the campus of the high school, the William S. George Center, has a visual history of the growth of similar Jesuit schools in the United States, with all their various seals. The Georgetown Preparatory Academy is the only Jesuit boarding school in the United States. The school was founded by the vision of John Carroll, the first bishop and archbishop of the United States. Carroll joined the “Society of Jesus,” (the Jesuits) in 1753, then joined the deaconate and eventually the priesthood. After a brief stay in Europe, Carroll returned to the American colonies when Pope Clement XIV began to suppress the Jesuit influence because of their militancy and constant struggle to control the church in the New World (the Jesuit order was restored to the Roman Catholic church in 1814). Carroll’s work in the new United States grew quickly, establishing a Jesuit majority in the U.S.
Over the course of his public career, Brett Kavanaugh has repeatedly lauded the work of both John Carroll and the Jesuit order. 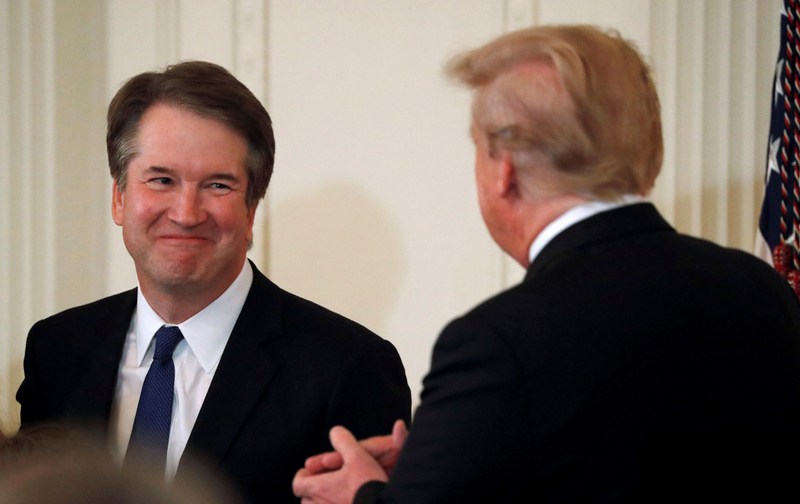 However, on top of the bad news that a Christian will not be filling the shoes of Justice Kennedy on the court if Trump’s nominee is approved, it seems unlikely that Kavanaugh will overturn Roe v Wade, the 1973 decision by the Supreme Court that is largely seen as legalizing abortion (there is a serious Constitutional question as to whether or not it is the role of the judicial branch of government to make something legal or illegal). While some conservatives are happy with Trump’s selection of Kavanaugh because he appears to be a strict constructionist and originalist – desiring to interpret the Constitution as it was originally designed to be understood – others are signaling that Kavanaugh’s one area of weakness is the issue of abortion, one of the most monumental overreaches of judicial power in U.S. history. In May of 2006, Kavanaugh was asked by Chuck Schumer during his confirmation hearings for the D.C. Circuit Court if he would uphold Roe V Wade and he answered in the affirmative. This incident is one of the very few times Kavanaugh has responded to direct questions about abortion, but it does not bode well for pro-life conservatives. Last October, Kavanaugh was a part of an appellate decision in which the “right to an abortion” for an illegal immigrant was confirmed, but not the right to “immediate abortion on demand.” In other words, it was Kavanaugh’s opinion that the abortion could wait until the baby was a bit older in the womb and that it wasn’t urgent. This is hardly a pro-life victory. A dissenting opinion on the appellate panel, from Judge Karen LeCraft Henderson, argued – unlike Kavanaugh – that the illegal alien had no “right” to an abortion because she wasn’t a Citizen to begin with. While pro-abortion activists are panicking over Kavanaugh’s selection, from every possible indicator it seems that the Justice may limit certain access to abortion, but it is highly unlikely that he would vote to overturn Roe altogether. And for the unborn, that’s no real victory. In the meantime, pro-life proponents hope that Kavanaugh has been intentionally silent on abortion during his career so as to be able to pass Senate confirmation hearings, should he ever be nominated for the Supreme Court. While possible, this scenario is probably unlikely.